FORTRESS "Phantom" DIGITAL FOOD PROCESS METAL DETECTOR WITH BELT CONVEYOR, with 17 inch high by 16 inch wide usable aperture opening. Aluminum search head enclosure painted with metallic paint, on an all stainless steel through conveyor. 12 inch wide by 84 inch long plastic interlocking chain type conveyor belt with belt-stop alarm reject, running in a left to right product flow orientation from the perspective of one standing at the digital control panel with automatic product calibration and product preset features. The conveyor sits on threaded foot pads adjustable for 32 inch to 36 inch working height. Complete with digital touchpad controls. 110 volt single phase (standard household current) electrical input. Food grade sanitary washdown construction, for food processing industrial metal detection. As of this writing, this conveyorized metal detector is in the process of being refurbished by our shop to assure EXCELLENT operational, electrical, mechanical, and cosmetic condition. If you have trouble viewing the VIDEO above, click HERE. 37 inch wide by 60 inch long by 27 inch deep mixer vessel, with (2) 7 inch by11 inch wide pneumatically operated spade shaped discharge doors at the bottom end. Agitator ribbons are 1/2 inch thick by 1.5 inch wide, and run outside 2.5 inch diameter shafts. Complete with hinged top dumping grid with safety interlock switch wired to stainless steel electrical control panel with mixer reverse switch, controlling the (2) 3HP 208/230/460 volt 3 phase drive motors. One pneumatic valve is currently set to control both dischage doors together. As of this writing, this twin ribbon mixer is in stock in good operational condition, available for timely shipment. If you can't see the video above, CLICK HERE! Goring Kerr Model DSP2 digital conveyorized metal detector with stainless steel belt transfer conveyor. The detection head is mounted on a 9.75 inch wide by 56 inch long belt conveyor running in a left to right product flow direction (from the perspective of the control panel), with plastic interlocking chain type belt. The conveyor belt runs at a 54 inch working height. 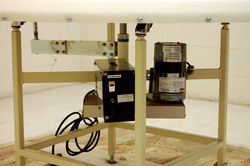 This integrated metal detection system features a pneumatic (compressed air) blow-off reject system with an air tank; --with the reject push-off direction to the right. Digital operator controls with product presets facilitating fine tuning and quick changeover for multiple products. 110 / 220 volt (standard household current) single phase electrical input for both the detection head and conveyor drive. As of this writing, this metal detection system is in stock in GOOD OPERATIONAL CONDITION, available for immediate shipment as configured, OR with some lead time, our shop can refurbish the conveyor with a reject setup, belt speed, and conveyor working height to buyer specification. OR find it by entering the Alard item reference number (below) into any search window on our https://www.alard-equipment.com site. If you can't see the video above, click HERE to see it. Manufacturer rated 130 lb capacity, 7.36 cubic foot removable basket which measures 30" diameter x 18" deep. All stainless steel product contacts. Includes operator controls with 10 minute settable timer, safety interlock lid, 5HP 230/460 volt 3 phase motor, and pneumatic brake. Thermaline Vicarb Model V60-SST-NP-250-CH, with type 304 stainless steel plates manufacturer tagged for 150psi @ 255 degrees Fahrenheit; with nitrile gaskets, mounted in a painted steel press frame, with 6 inch inlets and outlets. Per factory, original specification was for cooling vinegar at 350 gpm from 94 degrees Fahrenheit to 88 degrees Fahrenheit with a 7.36 psi drop using "tower water" at 350 gallons per minute, rising from 82 degrees Fahrenheight to 87.9 degrees Fahrenheit with a 5.91 psi pressure drop, at 1,021,941 BTU / hr. Owner recently removed from service in very good operational condition, and has available for immediate shipment (Northeastern US). NEW Packrite ROTARY ACCUMULATION TABLE. 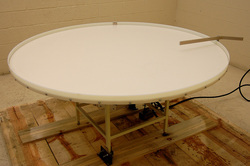 A 60 inch diameter Formica topped disk, with underside trunnion supports, manufacturer rated for 500 lbs capacity. 32 inch working height on a painted steel frame, with casters. 110 volt single phase (standard household current) variable speed drive controller. Currently configured as an accumulator / pack-off disk, but with the installation of rails and a container transfer, could be set up as an unscrambler disk. As of this writing, this accumulator disc / turntable is in stock NEW, and available for immediate shipment. 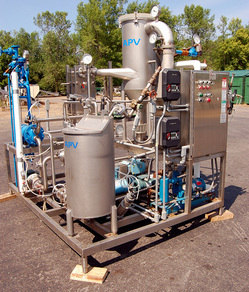 APV PREASSEMBLED EVAPORATOR / CONCENTRATOR. A skid-mounted R & D / pilot plant size manufacturer rated for 200 to 500 lbs per hour water removal, depending on product characteristics. Manufacturer documentation for all component parts and sub parts including control valves, regulators, liquid level controls, temperature controls, etc. Stainless steel separator, 18" diameter x 48" deep 4" in / out, 6" vapor outlet, acrylic cover. 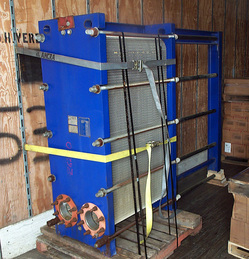 APV Paraflow stainless steel heat exchanger (18) 9" x 32" plates. ITT standard single pass shell & tube condenser. 30 gallon T316 stainless steel feed/balance tank with flanged connections. Bell & Gossett SU-62 two pass shell & tube heat exchanger. Waukesha Model 18 stainless steel positive feed pump with 3/4 HP 230/460 volt 3 phase gearmotor drive, 1 1/2" ports. Waukesha Model 60 stainless steel positive recirculation pump with 1 1/2 HP 230/460 volt 3 phase gearmotor drive, 2 1/2" ports variable frequency speed controller, rated duty: apple juice puree, 2-20gpm. Hot water pump, APV Model W20/20 centrifugal pump with 2 HP 230/460 volt 3 phase motor. Condensate pump, APV Model W20/20 centrifugal pump with 2 HP 230/460 volt 3 phase motor. Side mounted stainless steel control panel box. As of this writing, this APV concentrator is in stock in very good condition,available for immediate shipment. 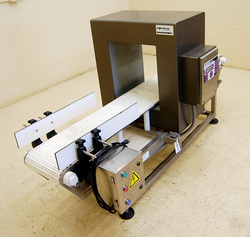 URSCHEL DICER, MODEL GK-A for flat or crinkle slices and/or strip cuts. All stainless steel product contact / USDA sanitary model. 10 inch (25.4 cm) slice shell opening. Complete with safety interlock system wired to factory electrical / operator control panel controlling it's 2HP 208/230/460 volt 3 phase drive. Manufacturer rated for uniform dices, french fry cuts, strip cuts and slices from a variety of soft ripe fruits and brittle root vegetables, in continuous tons-per-hour production, for product infeed sizes up to 5.5 inches (140mm) in any dimension. This machine is particularly well suited for the production of crinkle french fry strips from potatoes. Slice thickness (knob adjustable) from 1/8 inch to 3/4 inch (3.2mm to 19.1mm), crosscut spindles are available in sizes from 9/32inch to 7/8 inch (7.1mm to 22.2mm), and the circular knife spindle can be set up (with knives and spacers) in sizes from 1/8 inch to 3inch (3.2mm to 76mm). This machine can be set (with blades and change parts) for flat or krinkle cuts. Currently set up for 1/4 inch (6.35mm) dices, but other cutting parts are available (please give us your cutting specification!). 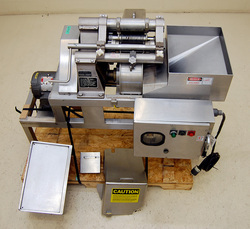 As of this writing, this Urschel GK-A dicer is in stock in good operational condition, available for timely shipment.